Unions. Change. Lives. This idea was central to the 2018 Joint Legislative Conference. The conference brought more than 500 union members, leaders, and activists to Sacramento to celebrate the impact of unions in the lives of working people and recommit to protecting our movement in the years to come. 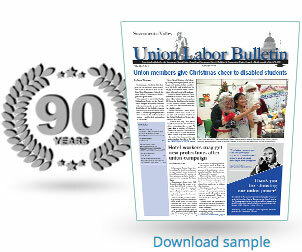 The Joint Legislative Conference theme underscores the critical need for unions today. Working people standing together in their unions have a fair shot at a living wage and good benefits that can support a family. Workers have a voice and safer working conditions on the job when they have a union. Unions built the middle class and make the American Dream possible for all. California Labor’s legislative agenda features bold ideas and bills that will help all working people, whether they are in a union or not. This agenda will protect workers against corporate greed and soaring inequality, fortify laws that keep workers safe and secure, and center workers in decisions about the future of work. The annual conference is sponsored by the California Labor Federation and the California State Building and Construction Trades Council. Elected officials delivered passionate speeches about their commitment to working people and folks also heard from leaders on key issues facing working people. The Union Strong Lobby Day brought hundreds to the Capitol to champion legislative proposals that will improve the lives of all workers across California. After a rousing opening to the conference courtesy of local students in the Grant Union High School Drum Line, courageous leaders of the Teamsters’ Justice for Port Drivers Campaign led the Pledge of Allegiance. Unions demand social and economic justice for everyone. We’re the best defenders of democracy in the country! Everyday our work renews the promise of fairness and equality in America. 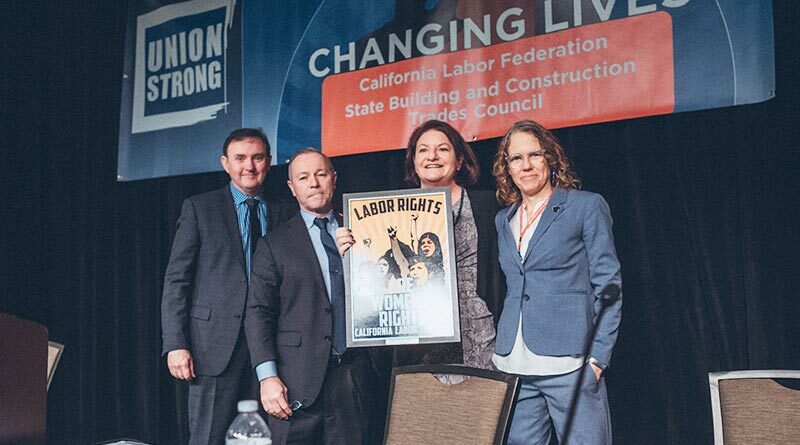 During the morning program, attendees also witnessed history in the making when Senate President Pro-Tem-elect Toni Atkins was presented with a California Labor commemorative Women’s March poster titled Labor Rights are Women’s Rights to congratulate her as she prepares to be sworn in as the first woman Senate President Pro Tem of California. “There’s not a voter in California or in the US who says that corporations are not making enough money or that the CEOs aren’t making enough. No! Voters want to hear candidates say that they stand with working people! “We’ve got to keep our feet on the ground and our eyes on the stars. That’s what High Speed Rail is!” He later wrapped up his speech by proclaiming, “You will not find a more pro-labor Governor ever” to a roaring standing ovation. In addition to the incredible speakers program throughout the day, conference attendees also attended briefings on a variety of worker-related issues including Tools to Build Stronger Unions Before & After Janus; New Laws: Retaliation, Raids & Forced Arbitration; How Technology, Automation & AI are Changing Work; and California’s Political Future: State of the 2018 Elections. During the day attendees also heard from legislative leaders including Chair of the Senate Labor Committee Dr. Richard Pan, Speaker of the Assembly Anthony Rendon and Chair of the Assembly Labor and Employment Committee Tony Thurmond.